As a former teacher turned unschooling mom, one of the many things I love about BookShark is the variety of resources which spark interest in topics that might otherwise seem a bit dense for young children. For example, I recently had the idea to introduce my six-year-old to the wonderful world of ancient Greek and Roman history. I was struggling to come up with a way to make it fun for her and something she’d want to explore for more than just one day. I wasn’t positive I could pull this off, but I wanted her to explore this important and downright cool period in ancient history. So I decided to go for it. My starting point was to look at my BookShark resources and then embellish them with our unique unschooling flair. The first thing I did was pull out the catapult kit from the Hands-On History kit by BookShark. While the catapult is grouped with the Medieval period in the curriculum, I decided to put it with the Greeks, who invented it. Again this is the beauty of homeschooling and having a number of amazing resources on hand: we can make each learning day whatever we want. 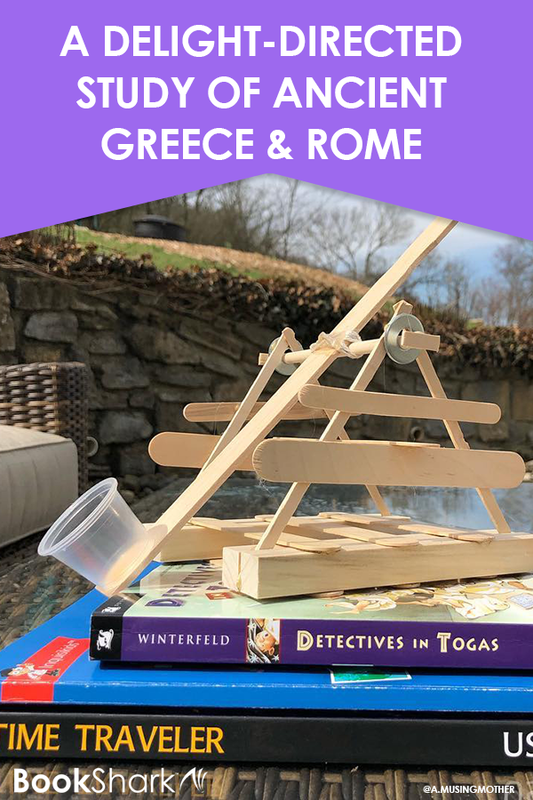 I also knew I wanted to use the novel, Detectives in Togas from BookShark Level 1, but I still wanted several fun projects to bring all of it to life for my daughter, who tends to learn more toward creative projects. So, with catapult kit and a novel in hand, I took a deep breath and came up with some other ideas to grab and hold my daughter’s attention. What did the ancient Greeks and Roman eat? Lay out a lunch of olives, grapes, cheese, apples or pomegranates, smoked salmon, lentil soup, and fresh baked bread. What did the ancient Greeks and/or Roman wear? Style a toga and an olive branch headband or a shield and Roman soldier helmet. What did the Greeks believe in their mythology? We studied the story of Orion and used the telescope to find the constellation in the night sky. Then using a large cardboard box, we fashioned a night sky using holiday lights that we poked through holes. My daughter crawled inside to look up at her own starry night. How did Greeks fight battles? 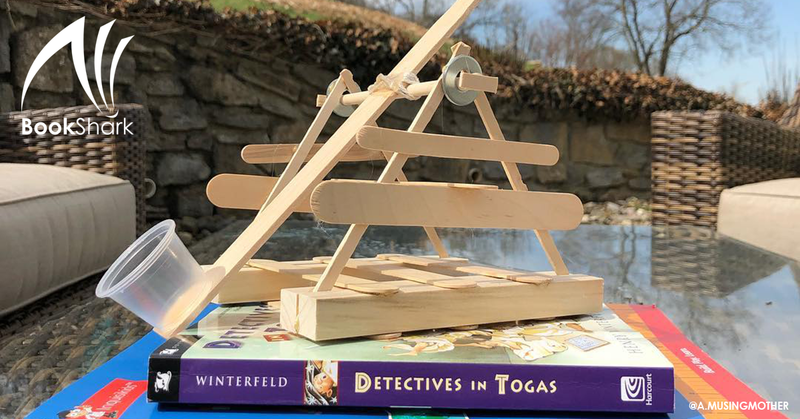 Build the wooden model from the Hands-On History kit, then measure and compare the distance that various items flew when launched from the working catapult. How did children write in school? Make a wax tablet using a baking sheet, wax paper, melted wax, and a small dowel or small stick. Who were important characters from Greek and Roman mythology? Let your child research Greek or Roman gods and goddesses. Then create a costume to represent the mythological deity they choose to dress up as. I love having the books and resources available at all times for my daughter to explore, even when we’re not using them formally for homeschool lessons. When I first started homeschooling, I closed up our school books in the cabinet when we were finished and pulled them out only for school time. This habit really diminished her interest. By keeping the resources available to her, my daughter voluntarily pulled materials out in the evenings to show her dad, or she looked through books while I made dinner. Letting her have the freedom to explore on her own really increased her interest. What made this ancient Greece and Rome study work so well for us was taking it slow, having fun, and following her lead. I alternated between reading time and hands-on activities to keep the energy flowing and, most importantly, I offered these activities simply as possibilities and encouraged my daughter to pick the ones that sounded the most interesting to her. This learning adventure has been amazing fun for my daughter, who loved catapulting various items across the room. She also enjoyed using the telescope to find Orion in the sky, reading about Caius, and dressing up as Gaia for a day. It is such a treat to me to have a secular homeschool curriculum that provides resources for teaching ancient Greek and Roman history to young children. 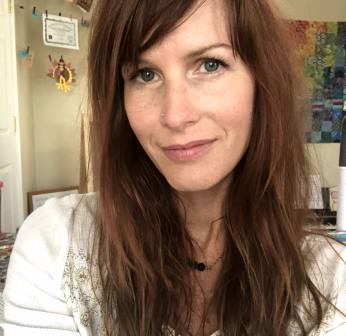 Resa Brandenburg is a former teacher who is now passionate about unschooling her daughter. She lives with her husband in an old farmhouse by the river in Kentucky. Her favorite thing to do is spend the afternoon with her family, including her grown sons and two grandchildren. Her hobbies include traveling, reading, and quilting. She blogs about life, love, and learning at A Musing Mother.